The Por Larranaga Panetelas is a rich yet a mild Habanos, of Short Panetela format, 5" (127mm) long, of 36 ring gauge, and comes in a 25 cigars box. Neglected by many cigar smokers, mainly because it is not for sale in all countries, it is nevertheless a very traditional Cuban cigar, full of character. Surely the lightest cigar from Por Larrañaga. The tobacco aromas are very mild, dominated by wood and with light touches of leathery flavors. 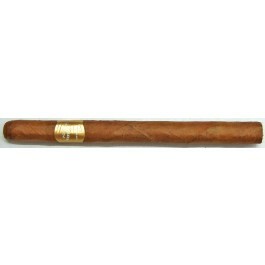 It is the perfect smoke for a short afternoon break, or for a newcomer to Cuban cigars. Outstanding. Smooth easy draw, fantastic floral aroma. • Medium-bodied, tangy and spicy. • Enough complexity to keep you on your toes. Good construction with a beautiful rustic oily brown wrapper. Foot appears to be well bunched. Woody aromas, also coffee beans and nice tobacco smell. Fantastic rich flavors of coffee, caramel and wood are detected; similar to the Montecristo No.4. A touch of sweetness balanced by some pleasant peat and cedar. Creamy, earthy, with some subtle leather. In summary, a great “go to” cigar with your morning coffee or after a post afternoon brunch or a mid-day break..